Doral's Royal Palm pool and spa is an oasis separate from the family pool and water play area. When real estate mogul and television star Donald Trump buys in, he buys in big. “The Donald’s” 150-million purchase of South Florida’s iconic Doral Golf Resort and Spa in 2012 gave him a renovated property he is already starting to remake again. The PGA Tour players competing there next week, along with the CBS TV viewers, will be among the first to see Trump’s work in progress. Trump’s trademark touches come first, of course. A stately, old-world fountain that would otherwise be found in Florence now gurgles water over white statues of stallions and naked cherubs in full view of the patio, restaurant, and first tee of the famed Blue Monster Golf Course. “Anyone hit the fountain with a golf ball yet?” I asked the starter. Trump, who renamed the private portion of the resort “Trump Doral Golf Club,” can land via chopper on a putting area near the fountain, as long as the pilot avoids the giant American flag installed behind the 18th green and the big, ornate, iron clock with Trump’s name atop it. Updated guest suites will be the most evident changes, while design adjustments to the Blue Monster course will happen during the next 10 months. Six miles from Miami International Airport, in the middle of suburban sprawl, Doral is an oasis. Park your car and have the valet throw away the keys. You can literally fall off of your veranda onto one of the golf courses in the footsteps of Jack Nicklaus, Tiger Woods and Henrik Stenson, who stripped to his underwear to play a shot from the muddy bank of a pond on the third hole. You can even learn to play like them at the acclaimed, on-site Jim McLean Golf Academy. For the non-golfer there are colorful, international dining experiences, shops, walking trails, panoramic fitness room, elaborate, stand-alone, European-style spa, and separate themed swimming pool areas for adults and families are among the offerings. Wanna get away? Imagine floating in a large, placid pool between tall hedges and under towering royal palms basked by the warm Florida sun. The only sound you’ll hear is the rushing water of the Jacuzzi waterfall fountains that provide an intensive hot aqua massage…only steps away from a Blue Monster Martini at the poolside bar. 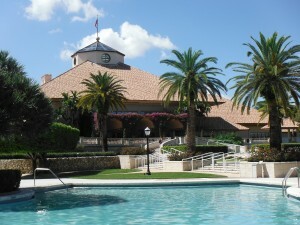 Doral, in its clientele and presentation, is a very international experience. Wrap your day by listening to Jazz music at Bossa Nova Lounge after a Latin dinner overlooking the course at Mesazul…where you might even run into Donald Trump. Rainy Day People Are Fun Travelers…Are You? THE OUTER BANKS ARE FAR OUT! THE PRISTINE ISLANDS ACCESSIBLE FOR FAMILY ADVENTURES!